Wow those are words to live by…. As I see it, you can attend religious services 24/7 but if you aren’t living by the positive words (that you clearly understand) in that religious text, then you are merely playing pretend. You’re dressing up and playing a role. Whether it’s the Bible, Torah, Quran, Sutras, Vedith, or any other religious text—live to the fullest all of the positive commands that it calls on you to do. Demonstrate the positive examples shared in the text. Steer clear of the trappings the text warns of, and don’t do what you know will cause harm. What you don’t know or understand from the text you can learn to grasp later. For now, do and be all that you know. Live right now as the positive role model that you want others to aspire to become. Stop playing pretend during religious ceremonies and services, and/or on social media. It’s hypocritical, and eventually you will be revealed as a fraud. There’s no reason not to do right, only excuses to remain in the dark— mediocre and in pain. Do you know how difficult it is to not find fault in someone else? Those men looked high and low, and in between to find some ‘dirt’ on Daniel. They tried to find one shred of evidence to prove that he was corrupt, untrustworthy, and negligent—but found NOTHING! That is beyond deep. What man or woman can stand here today and claim to never have been negligent, untrustworthy or corrupt on any level? We turn and tell someone’s personal business soon after they tell us, we take longer breaks at work—knowing it’s against the rules; lie about why we’re late to work or couldn’t come in; we don’t complete tasks at home and at work because our minds were on doing something we wanted to do (something more enjoyable). How many of you have taken office supplies from work? How many of you don’t spend enough time with your husband, wife, significant other, kids—when you know you can make time? Who’s raising your children—you or their grandmother or nanny/babysitter? How many of you have been unfaithful in a relationship? No judgment from me, I’m just asking, and making a point. Daniel didn’t do any of these things. Daniel’s trust and faith was in God, so he walked the path God placed before him; he entered situations that most of us would flee from—but he did so with confidence, with a belief that if it was meant for him to be there then that is where he would remain. Fear makes us do stupid things. Fear makes us react instead of reflect. Fear makes us turn inward instead of turn to God. Daniel did not walk in fear— he walked in the strength of God. Today let us take the first step towards walking as Daniel did. Let us strive to be the type of people where no matter what someone tries to dig up in the future, they simply can’t find it. Father I want to be and live more like Daniel. I want my focus so keenly set on You and Your commands that no fault of wrongdoing can be found and made as a claim against me. I want to be whole and complete in You and in Your Word Father, that I seek comfort only with and in You; that I desire only the things I need and know that in time— when You say it’s time— You will see fit that I have those necessities. In Your laws and in man’s laws I want to walk uprightly so that in neither case will I ever be a disappointment to You. Thanking You now for the things that are still to come. Amen. Unless Otherwise Stated, all Prayers and Reflections are Copyright Protected by Natasha L. Foreman. Father many parts of the world are under extreme conflict, as man battles in war in hopes of conquering and ruling each other. Women and children are caught up in the cross-hairs as brainwashed participants and as battered victims of ruthlessness. Without You being the priority many nations will be destroyed. Father I pray for these lost souls. I pray for those who kill in Your name, by whatever name they call You. These are not people fighting the Holy war of centuries passed, but wars of power, control, and conflict—rooted in greed, envy, and fear. Father protect the innocent, and warm the hearts of the perpetrators that they might see Your ways—and seek peace, love, and dignity over fear and hate. Father whatever I can do to help spread Your love I will do. In Your Son’s name I pray. Amen. I saw this verse and immediately thought of the many countries around the world that are and have been fighting for years—some for hundreds of years. Some are fighting for their freedom, while their oppressors are fighting to keep them enslaved to a system that serves no one but the oppressor—it is not of God—but they declare an allegiance to Him (which is obviously false). Some people are fighting prejudice, bigotry, and racism. There are people fighting and dying over land, a sense of entitlement, and natural resources. There are nations invading other nations as a form of imperialism, masked as something seemingly more democratic and liberating for all— another form of False Evidence Appearing Real ringing true. We must pray for the victims and the tormentors, the benefactors and those who lose life and liberty. We must pray for ourselves— that our minds and hearts stay focused on God and His Kingdom; that the only side we take is God’s side and seek only to protect His children. Today look for ways that you can help people who are less fortunate than you, both domestically and abroad. Let God’s light shine. 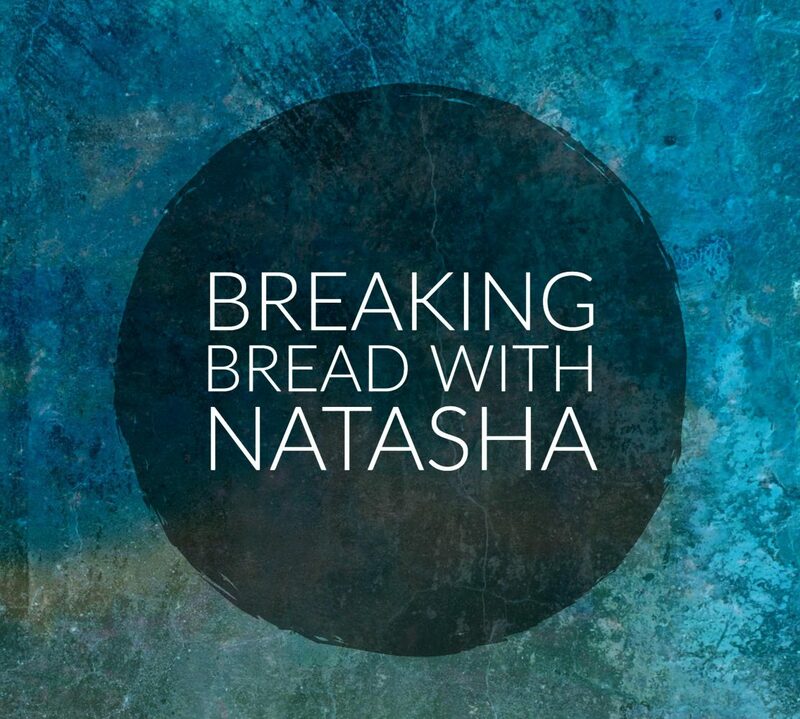 I share “Breaking Bread With Natasha” with the public because my relationship with God is not to be a private one, and because these messages are not just for the select few friends and family members that I have been sharing with for over 9 years now; but for anyone in need of doses of God’s loving-presence. Not everyone is deeply spiritual. Not everyone knows how to pray in their own way. Not everyone knows how to study the Bible. Not everyone stops frequently throughout their day to just give thanks to God and His Son. A planted seed when watered, takes on a life of its own. What you do with the fruit that it bears is up to you! Happy Tuesday everyone! Just as Jesus taught his disciples to heal, he has shown us that we all possess the power of God’s Mind and healing touch—we simply must believe. We must believe that our lives don’t cease to exist once our bodies have gone cold and rigid. We must believe that this is merely one level of existence, and that after we leave this level we go to another. We must believe that when times get hard (as they may be for many of you) that Jesus showed us the way to make due with what we had, to stretch our resources, and that God would provide. God knew that His children were shallow and could not rely on a God they could not see. He sent His Son to show them the way, and the majority of them doubted Jesus was the wayshower. How would life be if we all just believed? What are we afraid of? Why do we resist? Let’s ponder that and then in our daily walk with the Lord, let’s try to believe more in Jesus and our Father. Enjoy your day! Father You sent Your Son to show us the way to You, Your Truth, and Your light. The way to You is through Jesus Christ— all we must do is believe in him. I believe Father. I believe that he demonstrated that the dead can rise— because eternal life comes from You; that we can heal ourselves through You; that we can cast out demons and free our minds and bodies from slavery. Jesus showed us that through You there are no limitations to what the mind and body can do. He showed us that through You we can feed thousands with what appears will only feed several. We just have to believe. I believe Father. In Your Son Jesus’ name I pray. Amen.